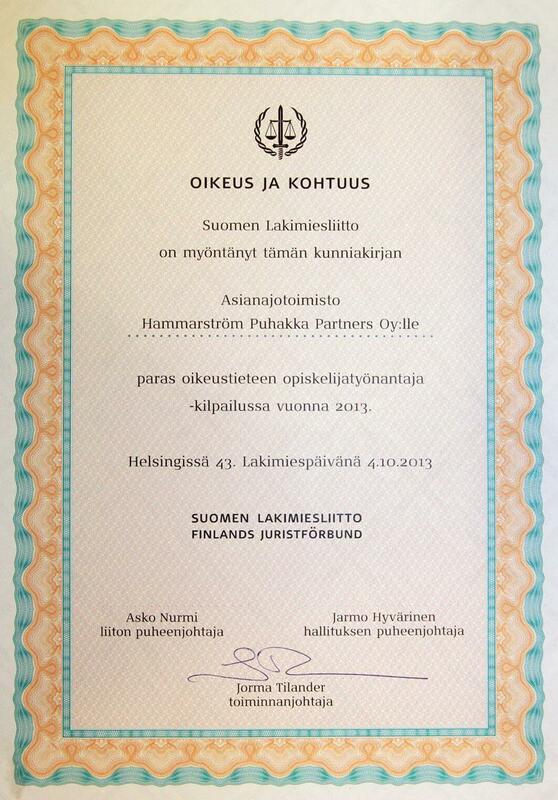 The Association of Finnish Lawyers has awarded Hammarström Puhakka Partners the title of the law student employer of the year 2013. The association conducted a survey in the spring of 2013 with over 400 law students participating. The recipient of the biennial award was announced during the professional lawyers’ fair at the Finlandia Hall on Friday 4 October 2013. The criteria by which the winner was selected included salaries, compliance with employment legislation, students’ opportunities to combine work and study, students’ orientation and training, students’ opportunity to seize challenges according to one’s level of study as well as a good and open work atmosphere.